Despite a title that sounds like science fiction, this is a down-to-earth look at the problems facing the American military, now and in years to come. Latiff is a retired Air Force major general and is the director of Intelligence Community Programs at George Mason University. He spent much of his service time researching new weapons technology, and in the opening chapters, he features some of the recent creations and what they may be once they are ready for the battlefield. Readers will get a solid nontechnical overview of developments in such fields as robotics, drones, biotechnology, and genetics, with hints of their possible applications to battlefield situations. Among the things the future may hold: a pill that lets soldiers forget traumatic combat experiences and, as a result, avoid PTSD and a drone capable of deciding on its own, in milliseconds, whether a potential target is a threat that it should eliminate. But Latiff is interested in more than the tactical implications. He puts particular stress on the ethical dimensions they call up: whether deleting a memory is an intrusion on the soldier’s personal integrity and whether life-and-death decisions should be entrusted to machines without a human in the loop. Already, we are seeing how drone pilots, often far removed from the targets they strike, can be traumatized by the choices they face. The author contends that the general detachment of most Americans from military matters—with an all-volunteer Army, few families have any personal stake in whether the nation goes to war—enables politicians to promote military solutions to any foreign policy issue or to vote for bloated defense budgets to boost employment in their districts. Latiff also calls out senior officers who inhabit a bubble populated only by other military personnel. This cleareyed focus on the larger dimensions of the military enterprise raises the book above the narrowly technical discussion of new weapons and the tactics they require. 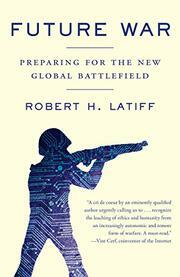 A well-written, thoughtful discussion of the broader issues raised by the introduction of futuristic technology to war.